For helpful tips and tricks and to find out more about why pale blue has been chosen as the Plascon’s Colour of the Month for March: here. 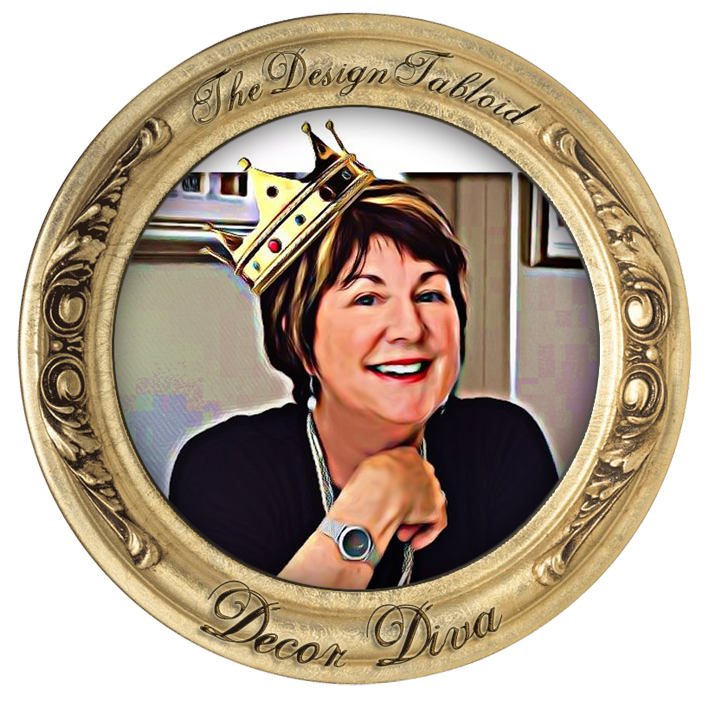 Ask Décor Diva: Does Blue Go With My Brown Leather Sofas? “I’m trying to jazz up my sitting room. I have two dark brown leather sofas which I love, and two big Morris chairs with loose cushions back and bottom. These need re-covering and I want to them to be the focus to pull everything together – so new upholstery on the chairs = new scatters for the couches, new rug. I can’t bear beige and shades of cream and brown (dogs and cats don’t help) but I love jewel colours and would like to go deep blue. Question: does blue go, do I need to pick a patterned, textured fabric for the chairs that would feature brown somehow to link with the couches. One thing I am pleased to hear is that our blog does not scare you off. Nice to know that we are regarded as approachable. I have to start off by saying that not having an image of the actual room and style of your sofa makes this reply very general. But I guess the purpose is to give you an indication of where to drive your thoughts. More to the point though is the fact that your query is whether or not your favoured colour choice of deep blue will work with your dark brown leather sofas? The answer to that is a definite YES it will. In fact Indigo blue and jewel blues will work very well with brown. 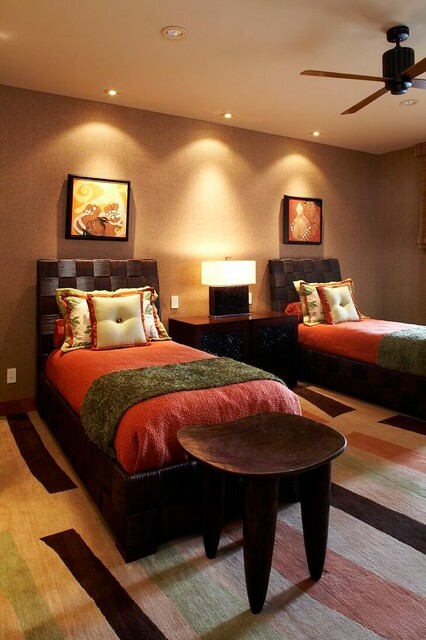 You can even consider introducing a some warm tones like a Tangerine Tango colour to add dimension and warmth. It is always best to work from the floor upwards in terms of décor layers. In your case, this would be your rug. If you are brave enough, I would suggest you consider something with Moroccan, Aztec, or Navajo patterns, which include the colours I mentioned earlier. Kilim is super trendy once again. 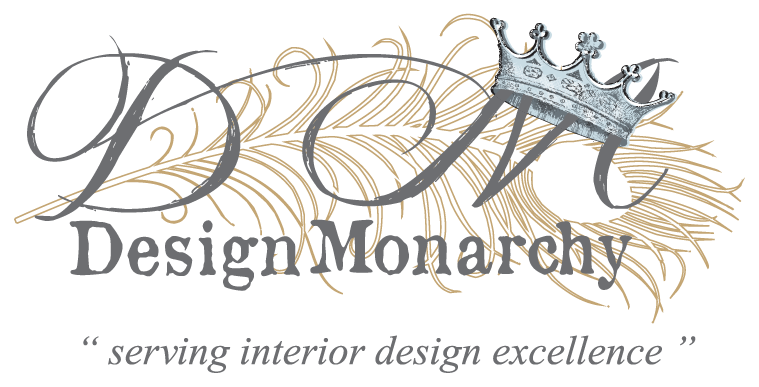 Then keep an element of fun going, by continuing on with pattern on your Morris chair cushions. I would say that a narrow striped fabric, with chenille or velvet type texture would work well – the stripes can be drawn from the colours in the rug. What you could also consider is using the stripes as the main fabric, and mixing that in with a matching plain fabric for the border. Then have loads of fun with your scatter cushions patterns and textures. Again draw the colours out of the rug. Mix in plain fabrics, with geo fabrics, with retro patterns, with stripes and then very tactile textures fabrics as well. Not too many scatters – they will literally be scattered around if too many. If your budget allows you, please consider using a feather mixture for these scatter inners. Vary these cushions in size and shape. Pop a rectangular scatter on each of the Morris chairs as well. Re-upholstery always presents a perfect opportunity of going about introducing your personal style in colours, patterns and texture. My advice to you would be to take your time in going about doing your research and sourcing – create a mood board using fabric samples, images of pattern, rugs, whatever you can find that represents the colours and patterns you want to introduce. Once you have that settled, go out and shop. Best of luck and enjoy the process! 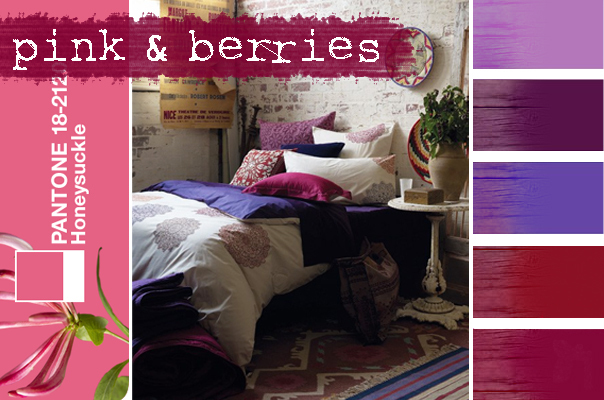 At the beginning of 2011 various berry colours did the rounds – luscious shades of purple, red and pink. Pantone’s colour of 2011, Honeysuckle Pink, probably had a large role to play in the berry-coloured trend. Since the trend is to draw our inspiration from nature in terms of colour, it comes as no surprise to find that the rich, warm and comforting colours of berries have unfolded onto the artist’s palette. The colour red hit the stage of fashion and design a number of years ago. And like most things that evolve, so too has the tones of red. This evolution has moved from being bold striking reds, to the more gentle tones of berry, cherry, pink, purple – and the most awesome part of it all, is that these same colours are boldly and effectively, being coupled with teal blue, deep aqua blue, chartreuse yellow, grey and black. Adding exciting and adventurous flavours that allows the man-in-the-street to dabble with colour in a manner not seen for a long time. Another awesome colour trend was the use of sunny yellow. I’m instantly drawn to the warm, friendly colour. We observed a good few beautiful yellow interiors – most often paired with another trending colour – grey. 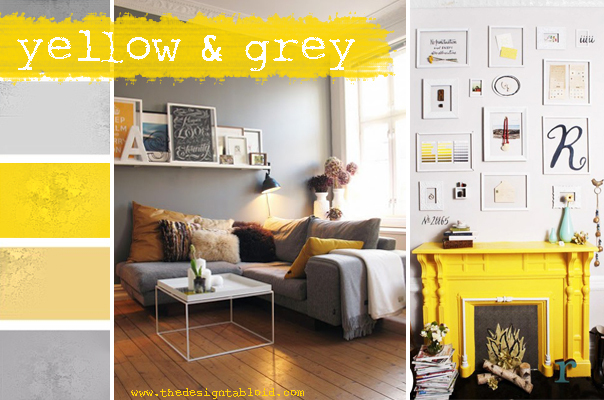 The predominant trend is to use pops of yellow as accent colour and the contrasting grey as a neutral base. Splashes of yellow adds some instant sunshine and statement to an interior as the use of such a bright yellow is quite bold. The combo of warm (yellow) and cool (grey) really complements contemporary interiors. 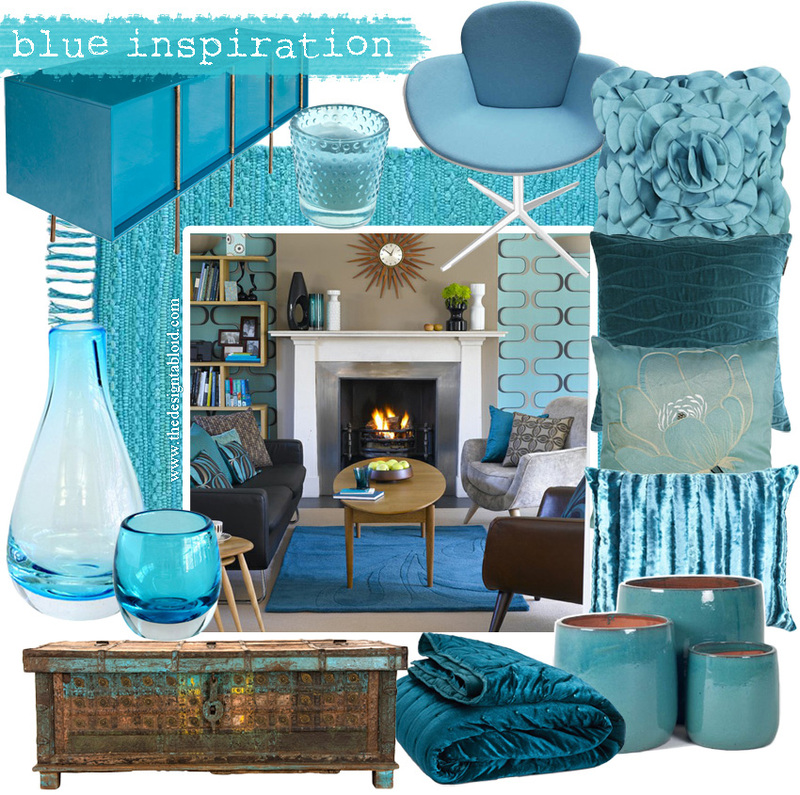 A colour trend that is still going strong, is my much-loved shades of blue. 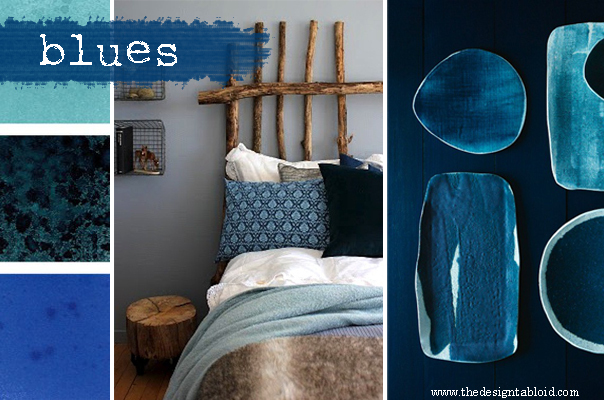 Blues of all shades and hues has been trending this past year – strong cobalt, bright ultramarine, deep indigo, sea-foam, aqua, turquoise, robin’s egg. Jeez, thinking of all the beautiful inky blues is making me all excited, lyrical even! Rose also agrees that this blue trend was by far her favourite colour trend of 2011 – lets hope it sticks around for another year or ten…blue is timeless. 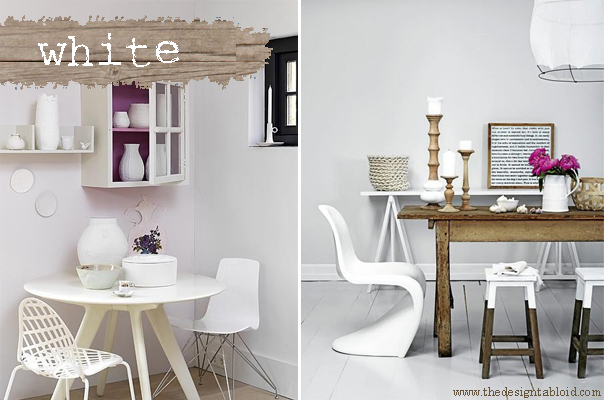 There is one of the past year’s colour trends that Rose and I really had to get used to – the all-white phenomenon. Hugely popular, we now see it in every other interior – white walls, white floors, splashes of accent colours and textures. Our problem, you see, is that we view walls and floors as an integral part of “layering” – an interior with white walls and floors is therefore missing “layers”. Rose and I have however grown to love this fresh and open style of decorating (when somehow refined) – it must be the Scandinavian influence. 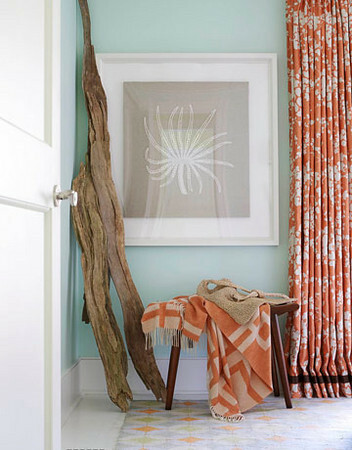 Towards the end of 2011 we saw gradual migration towards fresh spring colours – especially corals and salmons, usually paired with aqua and turquoise blues. I found the introduction of the coral and salmon hues quite surprising and unexpected. 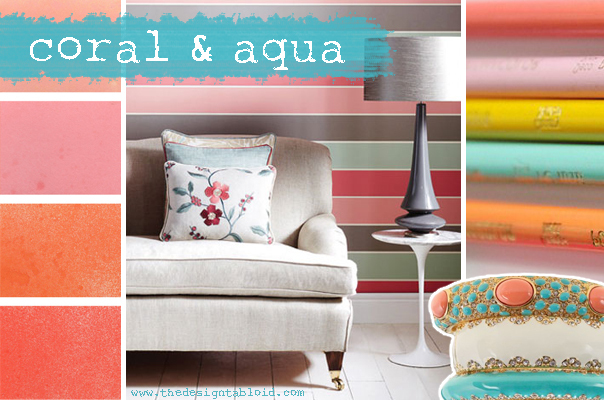 I can remember telling Rose “I will never like those – it’s just another name for shades of (dreadful) peach!” Luckily, I soon changed my mind – I can honestly say that the coral-aqua combo is one of my favourite colour trends of 2011. This pastel-coloured trend is also said to be one of the strong colour trends of 2012. So, what colour trends did you notice in 2011? We would love to hear about your favourites colour! 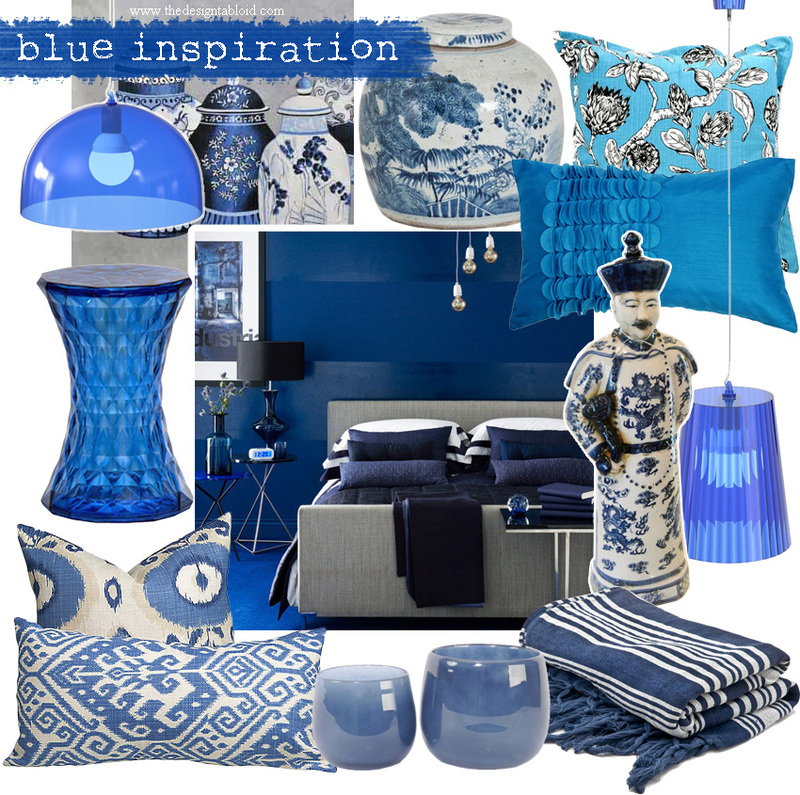 Hi, my name is Marica…and I am addicted to blue. I’m not ashamed to say it, whether it’s aqua, cobalt, indigo, robin’s egg, turquoise or ultramarine – blue attracts me like a magnet. Blue is known for being a calming colour. It can be strong and steadfast (the deeper, darker hues) or light and friendly (the lighter, brighter hues). Did you know blue can help you sleep? Because of it’s calming effects is a perfect colour for bedrooms. However, too much blue could can just as easily depress and chill. In 1999 the wizards at Pantone named the light almost sky blue Cerulean the colour of the new millennium. When considering colour in décor and design, I often wonder where the starting point of this specific topic is and where it end (if ever). 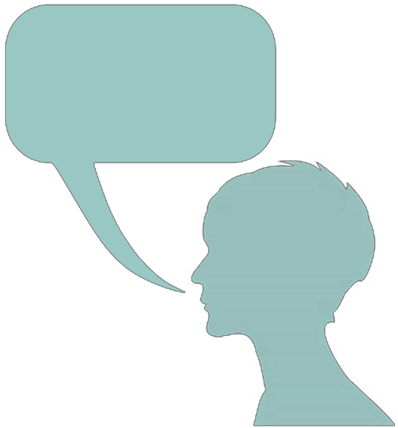 There is just so much to say about colour – its intentions, its effects, the trends, the do’s and the don’ts and more. But over and above all that, one thing I am always conscious of is the fact that colour is “individual specific”. What works for me may not work for you. Which brings me to the opinion I want to share with you today- the colours that just don’t do it for me any more and those that manage to grab my attention of late. 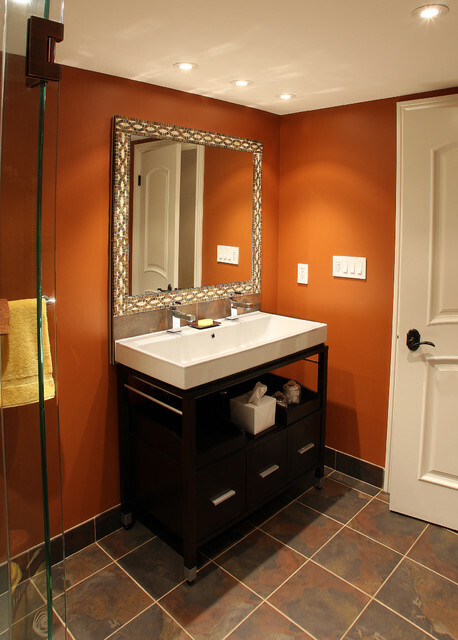 Terracotta walls and a dark stained vanity? Definitely does NOT do it for me! This earthy African interior is bland, dark and heavy. Give me colour that pops! Let’s start with the DON’T DO IT: Terracotta orange and clay colours, along with that dark stained finishes on wooden furniture and joinery items. For me the days of the dark kitchen cupboard doors and drawers, as well as dark coffee tables, dining chairs and tables are long gone tired, over and done with. That whole dark wenge and dark African mahogany wooden finish seemed to walk hand-in-hand with the deeper “earthy tones” of burnt orange and clay on a background of beige colours. Pretty much that “African” look. We were subjected to such an over-exposure of it, that it became anathema to me – loathed when encountered. That is where the problem lies – total over-exposure. Could the possibility also exist that working with these dark finishes were somewhat limiting and stifling, leading to creative boredom? It almost seems silly to be raising this style as a topic of discussion, particularly since there has been a natural progression from dark finishes to lighter natural wooden finishes with complimenting vibrant colours such as green, fresh oranges, soft browns and strong hues of blue. NOW THIS I CAN DO! The operative word here is VIBRANT. See how this pale blue compliments the terracotta! Beautiful and FRESH! With the gradual advent and introduction of growing eco-awareness, the shift to natural was inevitable. Somehow, that shift to all things a-la-natural has evoked a surge of creative energy, making it very difficult to grow tired of this natural trend. It is the foundation for a much broader colour spectrum and really can be such fun to work with. HOWEVER, having said all of that, I am not writing off the colour clay completely. In fact clay can be a fab complimentary colour (and burnt orange if it comes to that) when carefully paired up with another vibrant colour, such as a strong teal blue. Take this bathroom for instance. 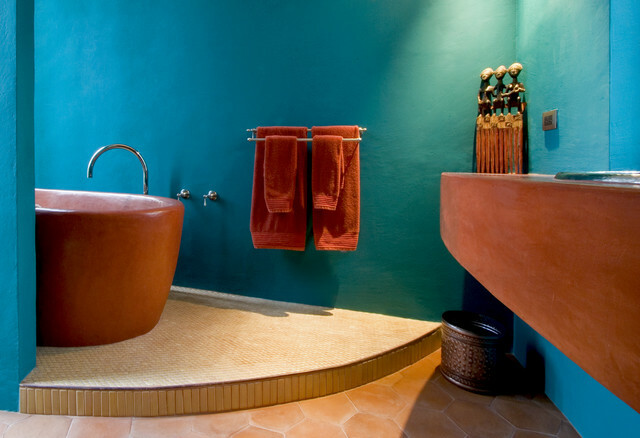 The feature colour is teal, complimented by the clay bath, vanity unit and towels. When it is not the dominant colour, IT CAN DO IT FOR ME. Images sourced from Houzz: here.